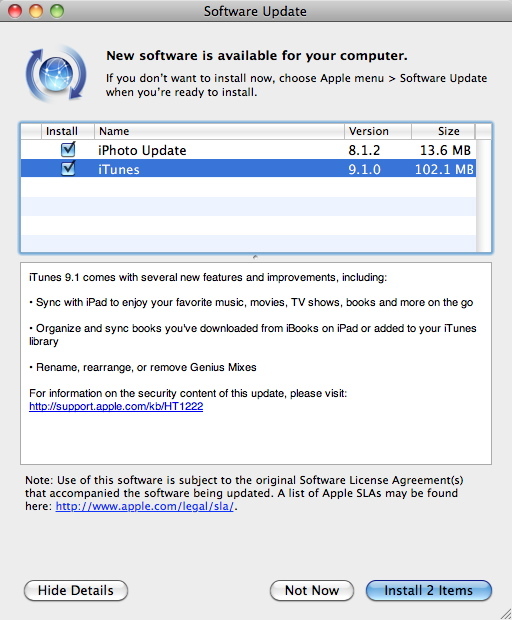 Apple has released iTunes 9.1.0. The update adds the ability to sync with the Apple iPad. It also includes the ability to sync e-books using the Apple iBooks app. Finally the update includes the ability to rename, rearrange or remove Genius Mixes. According to The Mac Observer the update includes security fixes for iTunes on Mac OS X 10.4 Tiger, Windows XP, Windows Vista and Windows 7. Apple also released iPhoto 8.1.2. The update includes iPad support and syncing improvements. 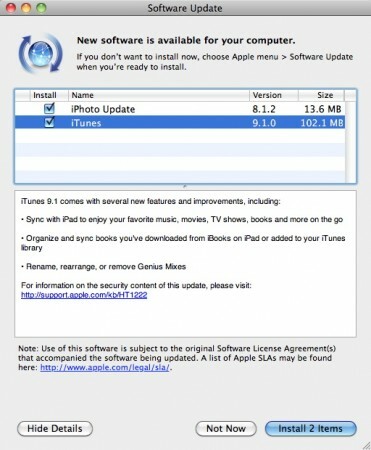 Updates are available from the Apple Update Utility. Pingback: iPhone 4 Rumor Round-Up: Multitasking at Last? | Stocks!